United Studios of Self Defense (USSD) has grown to become the largest Martial Arts and Self Defense organization throughout North America since its founding in 1968. USSD has over 80 locations nationwide and is growing every year teaching Kempo-style Martial Arts. Their iconic logo of the bonsai tree in front of the sun is one of the most recognized symbols for Martial Arts in North America. EYEMAGINE announced the launch of a new website for USSD, a brand offering self-defense classes all over North America. USSD selected EYEMAGINE for a complete website redesign to unify their brand and maximize their growth potential through exceptional user experience. Ultimately, this work won the Interactive Media Council's 2016 Best In Class Award. EYEMAGINE created a new corporate website for USSD and a new design for their studios to unite their brand and message across their entire network. USSD provided EYEMAGINE with mock ups of how they wanted their new corporate website and their franchise websites to look and feel. EYEMAGINE took those ideas and incorporated them into the final design. The result is a beautiful, effective, and responsive website that helps strengthen their brand and drive more students to their network of studios. The development team used Expression Engine CMS to create a multisite platform. They built a template based system that allows USSD to create a studio site in a single day. 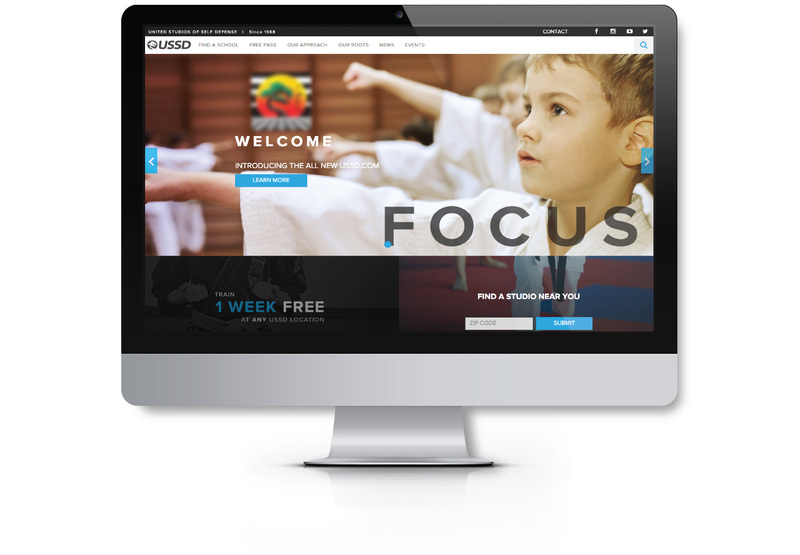 This allows USSD to keep a consistent brand and theme in their marketing to all their studios' Martial Arts clients. For the individual studios, it is now easy for them to publish news, events, articles, class schedules, and more through their new website. With social media integrated into their site, studios can now continue building their brand more effectively. The most important part of any website is the user experience. The priority in USSD's new website design was creating an easy-to-use navigation that worked well on a desktop or mobile device through a highly dynamic responsive design. A blog and calendar feature was implemented for USSD to easily publish new content and create events. Using a multisite platform, USSD can now create individual websites for all their studios with consistent branding in a single day. The template also includes a high-converting page to help studios sign up new students. For USSD's corporate site, the design team highlights offers (i.e. free passes) to add value to the visitor while collecting lead contact information quickly and effectively. 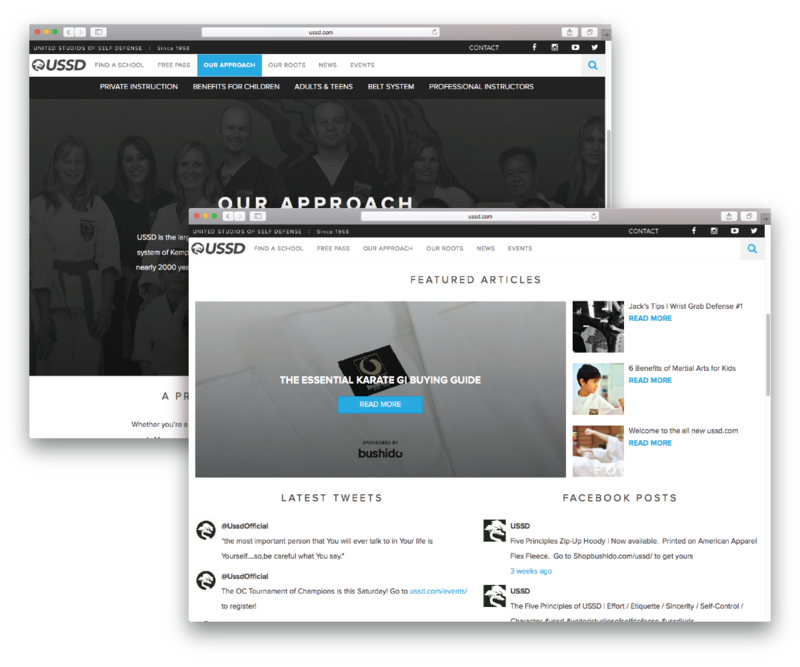 Social media was also integrated to help unify their social networks and build the brand even further from the website. The website redesign only marks the beginning of a relationship between USSD and EYEMAGINE. USSD has a true, long term partner in EYEMAGINE by using EYEMAGINE’s Managed eCommerce Services where they receive ongoing maintenance, cloud hosting, new feature implementations, and more.